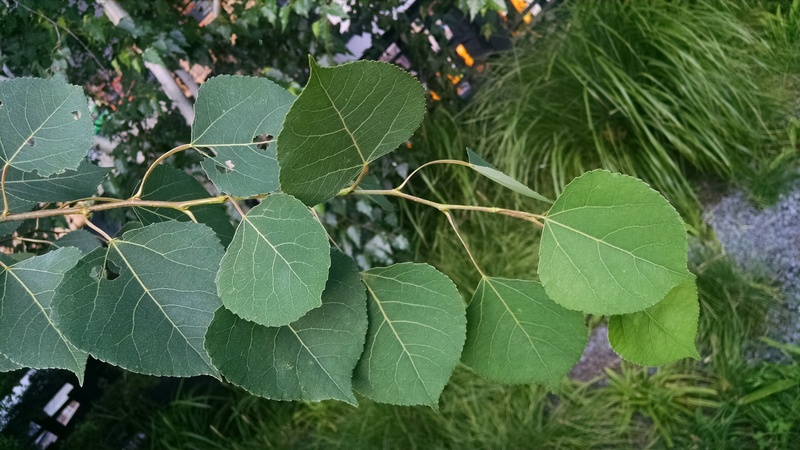 Earlier this week I was in New York City and got to visit the High Line for the first time. For those who aren’t familiar, the High Line is an urban park that was created along an abandoned elevated rail line on the Westside of Manhattan. Linda posted about the High Line a couple of years ago. Her visit was in late winter so my visit provided an opportunity to explore the park during the height of the growing season. The High Line runs from West 14th St. to West 34th st. 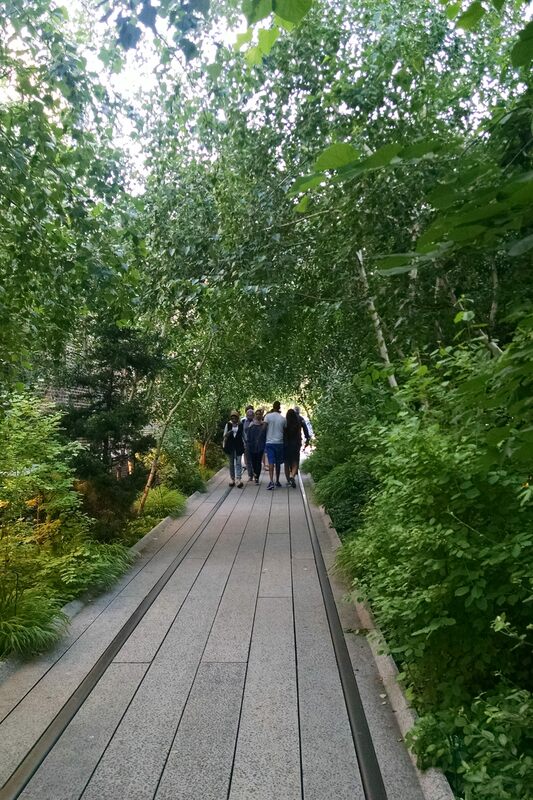 The High Line offers sweeping views of Manhattan to the east and the Hudson River on the west. For most of its length the trail consists of various beds of perennials, trees, and shrubs. Along the newest, northernmost section of the trail, the plantings give way to beds that have been allowed to re-seed naturally; providing an opportunity to observe urban ecological succession. 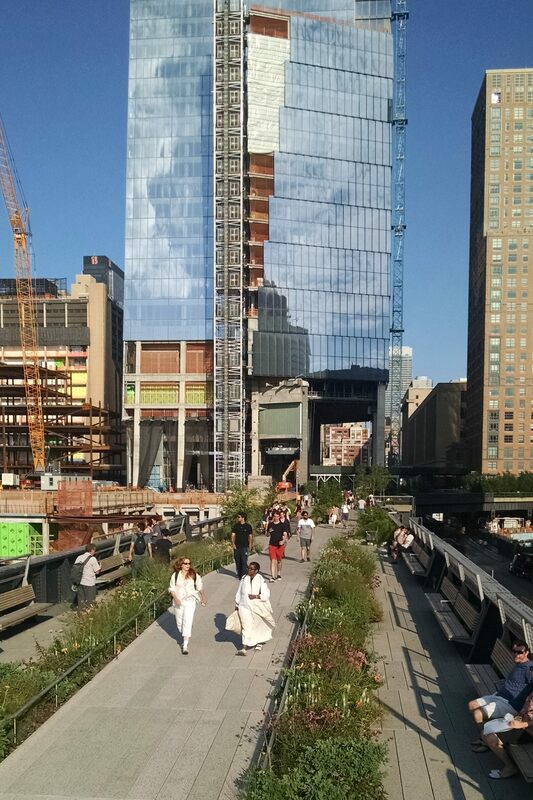 The High Line extends through the Chelsea section of Manhattan, which, according to locals, was a less than desirable location just a few years ago. With the advent of the High Line, however, Chelsea and adjacent Meatpacking district have become some of the trendiest and hottest real estate in the city. In fact it’s difficult to get a picture along the highline without a crane in the background. What a stark difference from the acreage for sale in Mission, BC that we visited, too bad we are city people. The High Line near West 30th St. 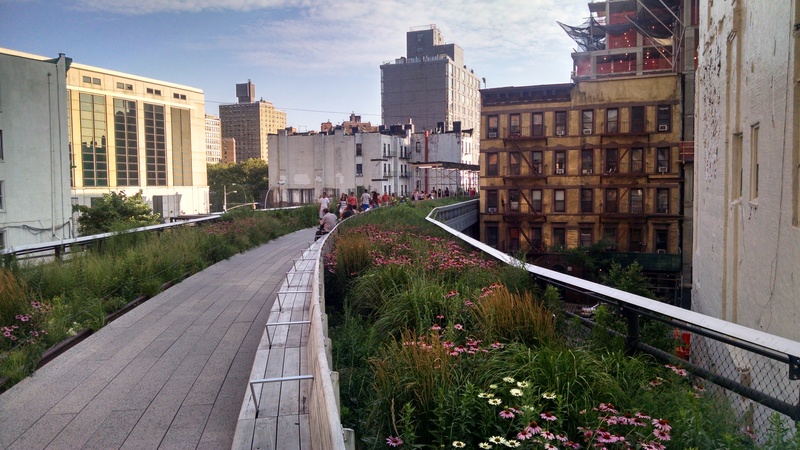 The High Line has helped transform a run-down section of Manhattan into some of the hottest real estate in New York. Art is an integral part of the High Line with various sculptures and interactive projects along the way. During my visit, kids of all ages had the opportunity to contribute to a giant Lego sculpture or add to a giant sidewalk painting. Interactive art. 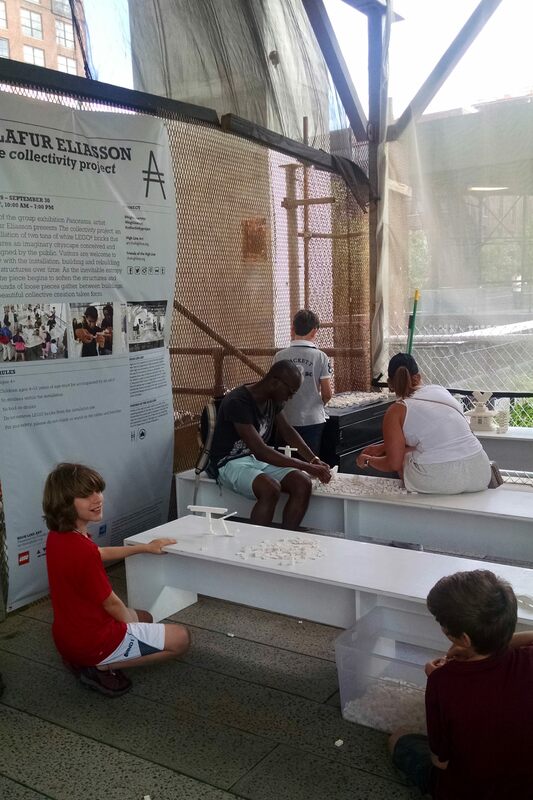 Kids of all ages take time out to add to a Lego construction project along the High Line. The first section of the High Line opened in 2009 and for the most part it seems to be holding up well. 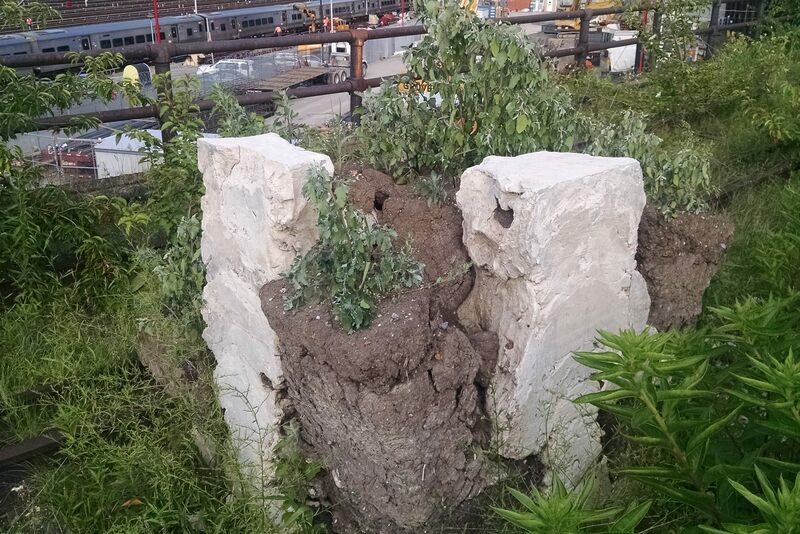 Some sections of the trail bed are constructed from crushed aggregate and these sections are pretty well pot-holed, presumably from freeze-thaw cycles. 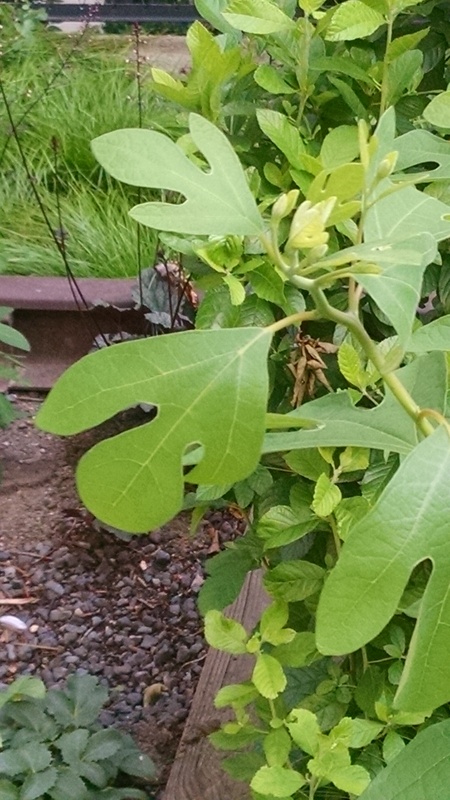 Most plants along the trail seem to be healthy and thriving, likely thanks to drip irrigation. It will be interesting to see how the trees and shrubs continue to develop and how things perform over the long haul. 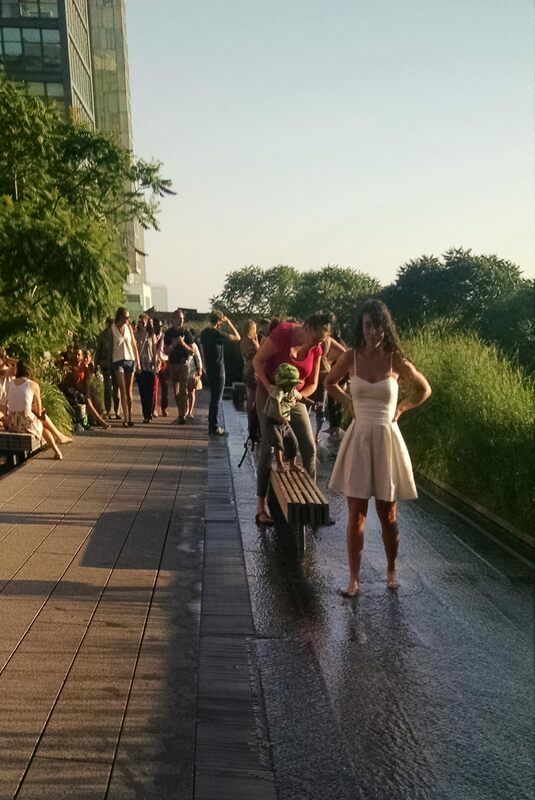 This sidewalk fountain provides a change to cool your heels on a warm and sticky New York afternoon. 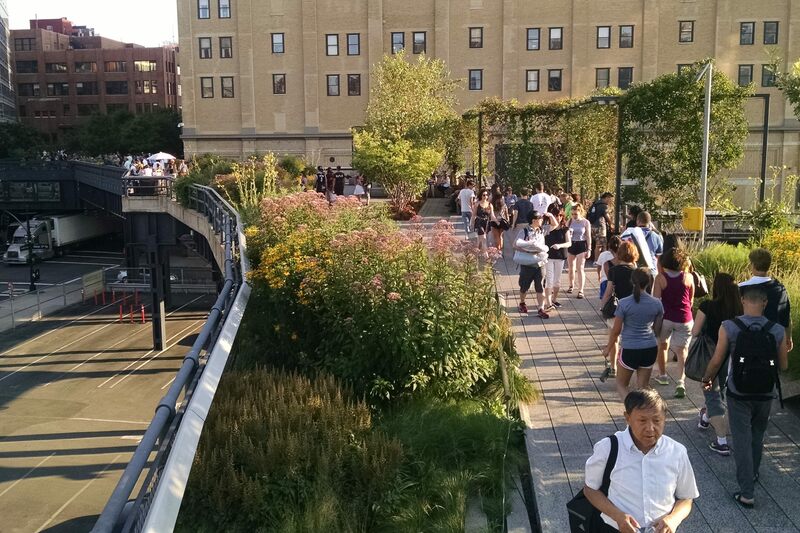 Bottom-line: If you’re in New York and you enjoy plants and watching people (and watching people enjoy plants), a couple hours on the High Line will be time well spent. 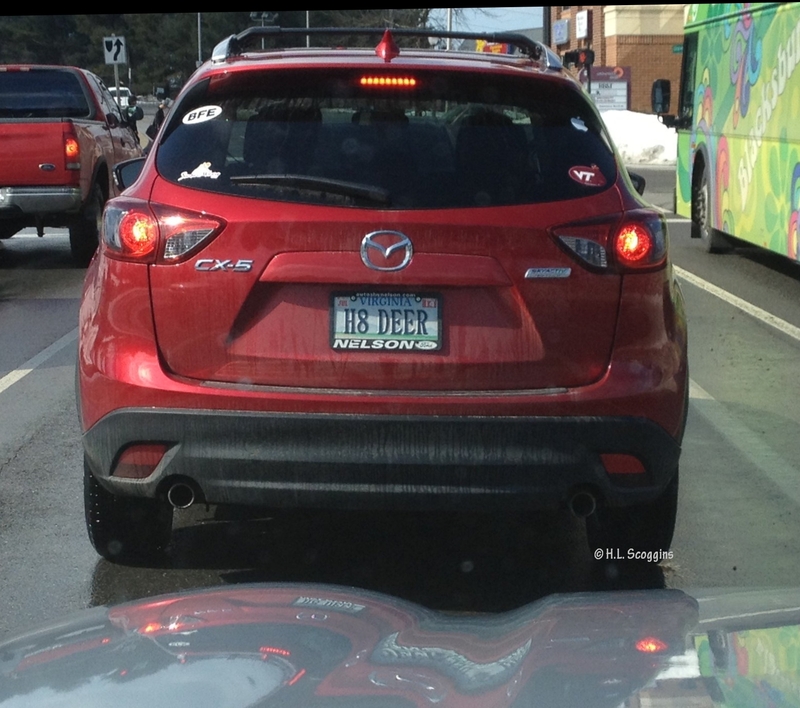 I nearly caused a wreck trying to get this photo. Monday’s not my usual day to post, but I need your help. I’m to present at a large garden symposium next week. You know the usual syposium format: there’s a design talk, one on plant care, another on edibles in the landscape, and finally the plant-lust generating presentation (The Plant Talk). That’s my role in this particular symposium. 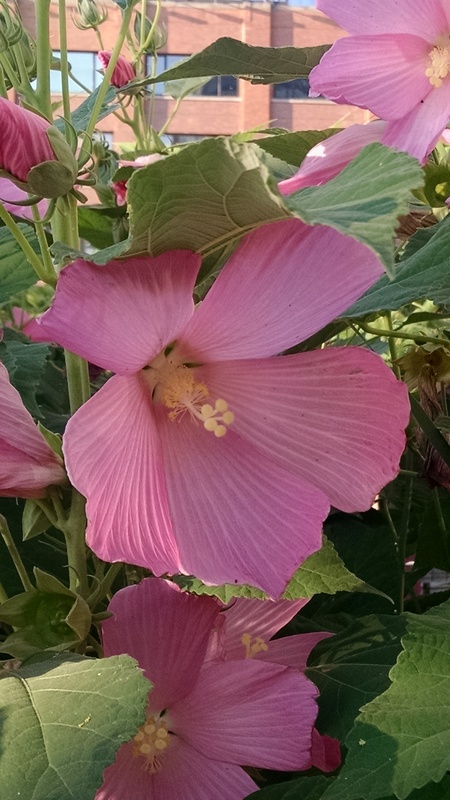 My topic is very broad – new and underused annuals, perennials, and woodies. Actually, it’s too broad, and it’s giving me fits. other than "Wow, look at this variegated foliage! Love it!" My issue is how to best arrange this disparate group of plants so that it makes the most sense to my audience. Currently, they’re grouped by plant type (perennial, annual, woody, ornamental grasses etc.) and alphabetically within. But I’m having second thoughts. How you can help: think back to the most useful and efficient presentations you’ve heard…how were they organized? As I have them (by type)? Season of interest (spring blooming, fall color, etc.)? Sun or shade? Alphabetically? Other? Eh? Posted on February 25, 2013 Author Holly ScogginsCategories Diversions17 Comments on Advice needed – quick! As Garden Professors, we are very careful regarding product endorsements. Actually, much energy is spent trying to bring to light weird/crappy/useless/money-wasting gardening products. But when we feel strongly about the usefulness, quality, and utility of a product, it is our duty to pass that information along as well. I didn’t mean to be a walking advertisement last weekend. We were in the final throes of getting our garden cut back; Joel was laughing that I “needed another set of hands” when I came around the corner. “Not with my fabulous Firehose Work Pants from Duluth Trading Company, I don’t!” Thus the inspiration for this post. All products noted are, variously: warm, waterproof, full of pockets, sharp, indestructible, dependable, and/or delicious. Correctomundo, Paul W. Right off the bat, darn it. Retractable (woven) roof; designed to accommodate a bit of snow, but you don’t want to leave it in place for any more than that. This was at the Merrifield Garden Center in Alexandria. Winter of 2011. I was there speaking to the fabulous Fairfax Master Gardeners and trainees (SandyG, I swear you were there). The snow cover just seemed kind of odd/neat, because the roof was closed back up by the time I walked in. Now THAT might kill the aphids! Here’s a very lightweight, non-strenuous puzzler for your Thursday. This scene is from inside a [very nice] retail garden center greenhouse. Posted on February 7, 2013 Author Holly ScogginsCategories Diversions, Friday puzzle4 Comments on Now THAT might kill the aphids! Won’t you help the poinsettias? Those creative Utah Sate University Extension folks are at it again. 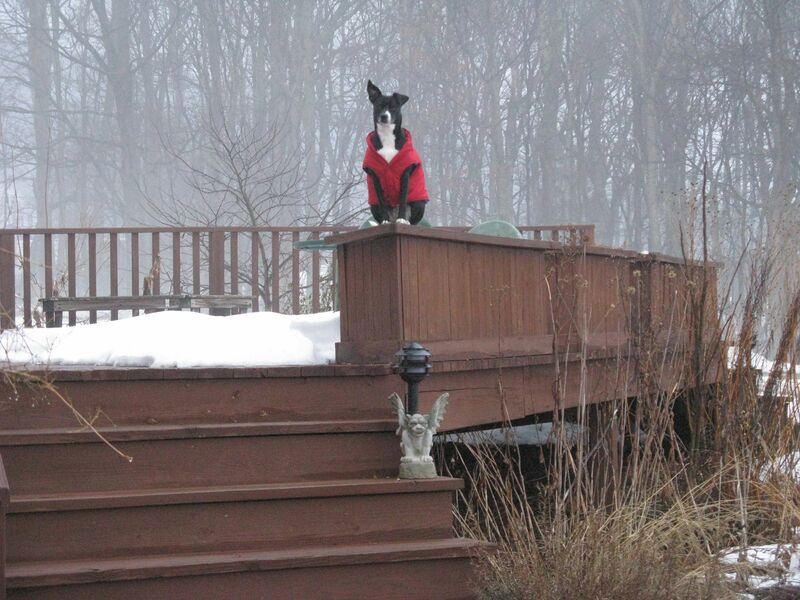 Jerry Goodspeed’s hilarious Gnome Management video was a big hit among the gardening crowd a couple of years ago. His current effort is a bit more…film noir. "Mission accomplished" if you’ve been shamed into watering that poor poinsettia languishing in the dining room. A little fertilizer wouldn’t hurt, either. Posted on January 11, 2013 Author Holly ScogginsCategories Diversions, Knock It OffTags garden humor, Poinsettia5 Comments on Won’t you help the poinsettias?